The use of money in China could be traced back to at least four thousand years ago. China was also the first country to use paper money, or credit currency in the world. Ancient paper money can only be described in general terms for lack of material objects. About the Pai-Lu P'i-pi (white deer-skin money) of Han Dynasty and the Fei-Chien (flying money) of Tang Dynasty, I personally have never seen the actual objects. However, the official issuing of paper money in Sung Dynasty is famous in the field of numismatic. [Chiao-Tzu (1008AD) and Chien-Yin (1105AD) of Northern Sung and Hui-Tzu (1160AD) and Kuan-Tzu (1131AD) of Southern Sung]. The use of paper moneys went on through the Yuan and Ming as well as the end of the Qing Dynasty. In 1897, China's first bank, the Commercial Bank of China was established by Sheng Hsuen Huai with the approval of the emperor, and beginning of issuing modern banknotes in China. Paper notes played their important roles in different stages of the money history of China. 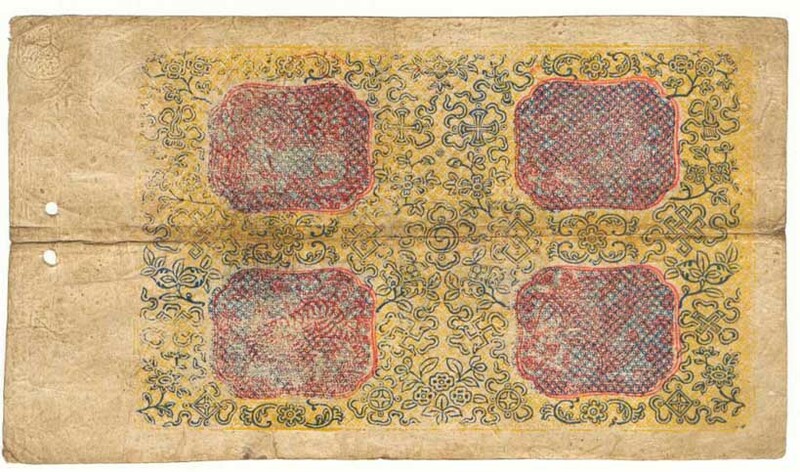 According to the book of "Standard Catalog of World Paper Money" by Mr. Albert Pick, notes of the Tam system were made many varieties in size, printing and color. Direct reading of security text is accomplished when the face is held up to a light source. 1672-87 (1926-41). Blue and red on yellow underprint. 2 lions at center. Back red and blue with lion, dragon, tiger and stylized creature. 157x101mm. a. Short serial #7 frame. 1672(Cycle 15); 1673-77 (Cycle 16). b. Long serial #7 frame. 1678-87 (Cycle 16). c. 1677(1931). #7A, but additional red circular seal over the serial # at upper right. : 1987 p.17, 51, 55, 60. 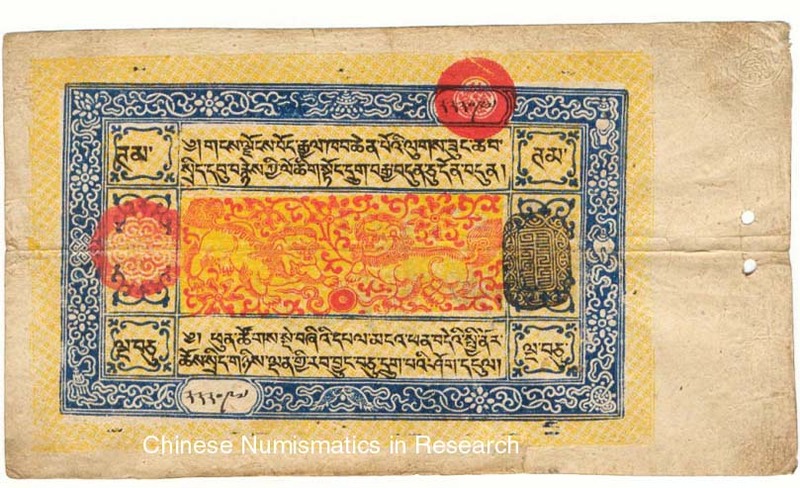 (The History of Tibetan Money).